Cacao’s nutrient profile leads to improved cognitive function, better mood, improved vision, healthy bones, and proper immune system functioning. It also supports a healthy cardiovascular system, improved blood flow, reduced blood pressure, and decreased insulin resistance. Again, who doesn’t love chocolate? For the full download, see my article: What is Cacao and why is it perfect for Smoothies? Spirulina is best known for being around 60-70% protein by dry weight, and contains all the essential amino acids. For vegans this may be the perfect protein source. It’s rich in iron and vitamin K and its dark pigments provide potent antioxidant properties. Its nutrient profile supports a healthy immune system, improved brain health, improved blood quality, and aids the body’s detoxification and cleansing efforts. Neither of these superfoods taste too super on their own – enter sweet fruit and sweeteners. If you’re new to cacao or spirulina, you might want to use half of what this recipe calls for. If you’re a seasoned vet, double down! Enjoy! I’d love to know if you tried this chocolate strawberry spirulina smoothie – please do tell in the comments below. Happy Blending! I have read above blog on Chocolate Strawberry Spirulina Smoothie its nice one i like this post yes i am agree with you Cacao is one of my all-time favorite superfoods. Who doesn’t love chocolate? It’s rich in magnesium, iron, chromium, vitamin C, and a good source of zinc, copper, and manganese. SOOOOO good!! I am on a cleanse and avoiding chocolate — basically trying to detox because I am 100% addicted. This really helped with my cravings. Super satisfying and just sweet enough with the cacao. Thanks! Hello,i am narges and i really like to talk to u about this topic,would u pleas send me ur email add? Feel free to contact me through the Contact form on my site. The link is below. Great to hear you enjoyed this superfood smoothie, Bec! 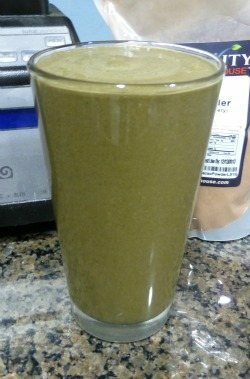 I was initially hesitant to add spirulina to my chocolate smoothies as well. Turns out they compliment each other nicely. I assume you are familiar with the Nutribullet products. One that might be useful for those recipes that have some chlorella, spirulina. Made with chlorella, spirulina, wheat grass, and alfalfa In a small 4 oz bag it is $15.00. I have seen it at Bed,Bath,Beyond ot the Nutribullet website. SuperFood Cleansing Greens looks like a fantastic product. I like that it’s USDA certified organic. Thanks for the tip. It would be a nice upgrade from just spirulina or chlorella powder. I make this smoothie all the time. I was able to find maca, cacao and spirulina on Amazon. I also use some hemp powder. Fills you up in the moring. I like the suggestion of adding coconut oil – I need to do that more often. Thanks for sharing, Mary. All of those superfoods usually lead to a super day. Check your email and confirm your subscription to my newsletter to receive a copy of my recipe e-book, Karen.